Do you need to disclose that a food company is paying you to write a blog? What should be added to your tweet if you’re tweeting on behalf of a client or sponsor? Could your tweet be considered misleading by the Federal Trade Commission? If you sell supplements and make money from them, must you disclose this financial incentive to your patients/clients? 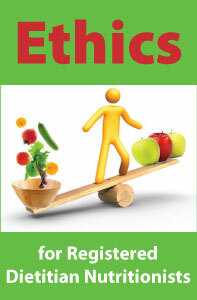 This course addresses the ethics of practice in nutrition and dietetics in today’s world. The practice and business of nutrition and dietetics grow and change but ethical practices remain paramount regardless. 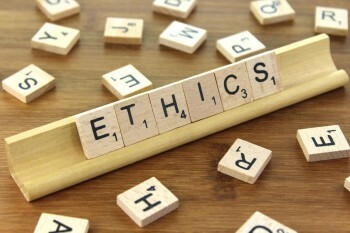 Potential situations arise that require a review of what the ethical solution(s) should be. Real scenarios are included so you can think about potential ethical issues. Utilize the profession’s Code of Ethics to identify these ethical issues and come up with solutions and ways to avoid unethical behaviors. Responding to a recommendation from the Academy of Nutrition and Dietetics’ Board of Directors, the Commission on Dietetic Registration voted to require that RDs and DTRs complete a minimum of 1 CPEU of Continuing Professional Education in Ethics (Learning Need Code 1050) during each 5-year recertification cycle in order to recertify. This requirement will be effective starting with the 5-year recertification cycle which ends on May 31, 2017, and will be phased in over a 5-year period for each recertification cycle. Susan Mitchell, PhD, RDN, LDN, FAND, is a nutrition consultant in digital and traditional media and communicates evidence-based health messages thru social media, radio, TV, video, and print. She also provides continuing education for health professionals through speaking, webinars and written articles/courses. Along with Dr. Christie, Dr. Mitchell is co-author of three books, Fat is Not Your Fate, I’d Kill for a Cookie, and Eat to Stay Young and is a contributing author to Macmillan Reference USA’s Nutrition and Well-Being A to Z. A Registered Dietitian Nutritionist, Fellow of the Academy of Nutrition and Dietetics, and Distinguished Florida Dietitian, Dr. Mitchell earned her Ph.D. from the University of Tennessee and taught nutrition and health science at the University of Central Florida for over 8 years. She serves on the University of North Florida’s Department of Nutrition & Dietetics Advisory Committee and the advisory board of Family Circle magazine. Drs. Christie and Mitchell have taught the Preventing Medical Errors in Dietetics Practice 2-hour course for over six years at the annual Florida Academy of Nutrition and Dietetics meeting. Catherine Christie, PhD, RDN, LDN, FAND, FPCNA, is Associate Dean, Professor, and Nutrition Graduate Program Director in the Brooks College of Health at the University of North Florida. She is a Past President of the Florida Academy of Nutrition and Dietetics and currently serves on the Board of Directors of the Academy of Nutrition and Dietetics. Cathy is co-author of four books including The Latino Food Lover’s Glossary, Fat is Not Your Fate, Eat to Stay Young and I’d Kill for a Cookie. Dr. Christie is also Editor of the Manual of Medical Nutrition Therapy. A Registered Dietitian Nutritionist, Fellow of the Preventative Cardiovascular Nurses Association and Fellow of the Academy of Nutrition and Dietetics, Dr. Christie earned her Ph.D. from Florida State University and served for six years as the Chairman of the Dietetics and Nutrition Council, which regulates the nutrition profession in the state of Florida. Dr. Christie is the recipient of several awards and/or certifications including Florida’s Distinguished Dietitian, Florida Dietetic Association Outstanding Service Award, the Academy of Nutrition and Dietetics Outstanding Dietetic Educator Award, and the Excellence in Practice Award for Education in Nutrition and Dietetics. Responding to a recommendation from the Academy Board of Directors, on May 9, 2011, the Commission on Dietetic Registration (CDR) voted to require that RDs and DTRs complete a minimum of 1 CPEU of Continuing Professional Education in Ethics (Learning Need Code 1050) during each 5-year recertification cycle in order to recertify. This requirement will be effective starting with the 5-year recertification cycle which ends on May 31, 2017, and will be phased in over a 5 year period for each recertification cycle. Catherine Christie, PhD, RDN, LDN, FAND, FPCNA, is Associate Dean, Professor, and Nutrition Graduate Program Director in the Brooks College of Health at the University of North Florida. She is a Past President of the Florida Academy of Nutrition and Dietetics and currently serves on the Board of Directors of the Academy of Nutrition and Dietetics. Cathy is co-author of four books including The Latino Food Lover’s Glossary, Fat is Not Your Fate, Eat to Stay Young and I’d Kill for a Cookie. Dr. Christie is also Editor of theManual of Medical Nutrition Therapy. A Registered Dietitian Nutritionist, Fellow of the Preventative Cardiovascular Nurses Association and Fellow of the Academy of Nutrition and Dietetics, Dr. Christie earned her Ph.D. from Florida State University and served for six years as the Chairman of the Dietetics and Nutrition Council, which regulates the nutrition profession in the state of Florida. Dr. Christie is the recipient of several awards and/or certifications including Florida’s Distinguished Dietitian, Florida Dietetic Association Outstanding Service Award, the Academy of Nutrition and Dietetics Outstanding Dietetic Educator Award, and the Excellence in Practice Award for Education in Nutrition and Dietetics. Susan Mitchell, PhD, RDN, LDN, FAND, is a nutrition consultant in digital and traditional media and communicates evidence-based health messages thru social media, radio, TV, video, and print. ?She also provides continuing education for health professionals through speaking, webinars and written articles/courses. Along with Dr. Christie, Dr. Mitchell is co-author of three books, Fat is Not Your Fate, I’d Kill for a Cookie, and Eat to Stay Young and is a contributing author to Macmillan Reference USA’s Nutrition and Well-Being A to Z. A Registered Dietitian Nutritionist, Fellow of the Academy of Nutrition and Dietetics, and Distinguished Florida Dietitian, Dr. Mitchell earned her Ph.D. from the University of Tennessee and taught nutrition and health science at the University of Central Florida for over 8 years. She serves on the University of North Florida’s Department of Nutrition & Dietetics Advisory Committee and the advisory board of Family Circle magazine. Drs. Christie and Mitchell have taught the Preventing Medical Errors in Dietetics Practice 2-hour course for over six years at the annual Florida Academy of Nutrition and Dietetics meeting. Professional Development Resources is a CPE Accredited Provider with the Commission on Dietetic Registration (CDR #PR001). CPE accreditation does not constitute endorsement by CDR of provider programs or materials. Professional Development Resources is also a provider with the Florida Council of Dietetics and Nutrition and is CE Broker compliant (#50-1635).